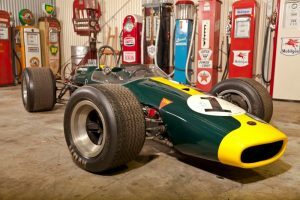 A pair of Brabham race cars found in a Northern N.S.W barn is being sold by Lloyds Auctions on the Gold Coast as part of The King’s Garage collection. Alstonville-based Brian King is the owner of the rare ‘barn-find’ Brabhams and is offering the cars, along with other significant historic race cars, classic petrol bowsers and assorted memorabilia at auction with all lots starting at one dollar. The Brabham name is synonymous with Formula One success with legendary driver Jack Brabham and engineer Ron Tauranac, combining in the early 1960s to produce race cars for over a decade culminating in the 1966-67 championship years, sweeping both the F1 World Drivers’ and Constructors’ Championships. Brabham remains the only person to ever win a Formula One race in a car and team of his own making. From this era come the two Brabham BT21B race cars on offer at Lloyds Auctions from The King’s Garage collection. A ‘one of one’ Brabham BT21B Cosworth formula race car with an exceedingly rare Cosworth SCB four-cylinder engine is the star of the collection with the Cosworth engine believed to be one of only two or three in existence. Allied to the rarity of the engine and chassis package is a provenance that begins in Brabham’s Formula One workshop with its chief engine builder Bob Ilich who was instrumental in the World Constructor and Driver Championships for Brabham in 1966 and ’67 who created this particular BT21B for himself. Another Brabham BT21B race car is being offered fresh from a high end ‘nut and bolt’ restoration in Formula 3 configuration with an MAE Cosworth engine and Hewland gearbox and is ready to compete world-wide in historic formulae including Formula Junior. The heyday of motor racing in the USA is represented by the gargantuan 1950 Sampson CC-50 Indianapolis 500 racer. Resplendent in its 1950 Indy 500 livery, #27 also comes virtually unused since a thorough restoration in the US prior to its arrival in Australia. Dirt track oval racing has historically been the feeder category for INDYCAR and NASCAR series and Lloyds is offering the #22 Chuck Porter 1947 Kurtis Kraft Offenhauser midget which has significant race provenance along with another iconic midget the #35 1974 Edmunds VW ‘El Toro Garage’ car. Still on the dirt track theme is the #5 1985 Chevy-powered Watson which has a dark history as five family members died while racing this car. Fuel bowsers are the new collectable for automotive enthusiasts and the range offered by The King’s Garage collection is staggering in its depth and quality with some fuel pumps going back to the early 1900s including Epex and French Satam four-gallon pumps. Other lots include a Porsche 356 ‘Super 90’ engine, a 27-litre Rolls Royce Merlin V12 engine, Cosworth FVA engine parts, and an A-series Mini Minor diesel engine. The auction for The King’s Garage collection is open for bidding online now with the live auction on 18 March 2017. Phone bidding is available.